Mangrove ecosystems play an important, but understudied, role in the cycling of carbon in tropical and subtropical coastal ocean environments. In the present study, we examined the diel dynamics of seawater carbon dioxide (CO2) and dissolved oxygen (DO) for a mangrove-dominated marine ecosystem (Mangrove Bay) and an adjacent intracoastal waterway (Ferry Reach) on the island of Bermuda. 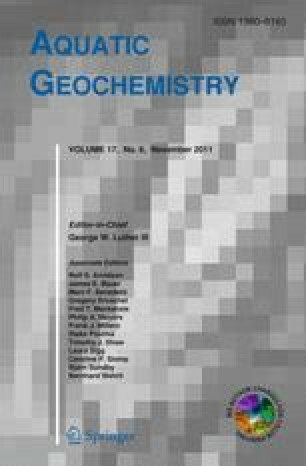 Spatial and temporal trends in seawater carbonate chemistry and associated variables were assessed from direct measurements of dissolved inorganic carbon, total alkalinity, dissolved oxygen (DO), temperature, and salinity. Diel pCO2 variability was interpolated across hourly wind speed measurements to determine variability in daily CO2 fluxes for the month of October 2007 in Bermuda. From these observations, we estimated rates of net sea to air CO2 exchange for these two coastal ecosystems at 59.8 ± 17.3 in Mangrove Bay and 5.5 ± 1.3 mmol m−2 d−1 in Ferry Reach. These results highlight the potential for large differences in carbonate system functioning and sea-air CO2 flux in adjacent coastal environments. In addition, observation of large diel variability in CO2 system parameters (e.g., mean pCO2: 390–2,841 μatm; mean pHT: 8.05–7.34) underscores the need for careful consideration of diel cycles in long-term sampling regimes and flux estimates. We would like to thank David Cook, Marlene Jefferies, Roger Meyer, and Keven Neely for their assistance in the field and in the laboratory. We would also like to thank two anonymous reviewers, whose comments helped improve the manuscript. This research was supported in part by the Research Experience for Undergraduates (REU) Program from the National Science Foundation.